At the L.A. Auto Show this week, leading car makers revealed their plans for hydrogen fuel cell vehicles, which use the most common molecule in the universe for power and release only water vapor as exhaust. Toyota made a splash at the Auto Show by announcing that its hydrogen fuel cell system in a four-passenger sedan, the Mirai, will begin selling in December. The midsized Mirai will have a base sticker price of $57,500. Toyota said the Mirai can accelerate from 0-60 mph in 9.0 seconds, and also claims the car can go from 25 to 40 mph (to pass other vehicles) in about three seconds. Meanwhile, Honda announced it will delay the release of its fuel cell car, the FCX Clarity Fuel Cell Electric Vehicle (FCEV), until 2016. 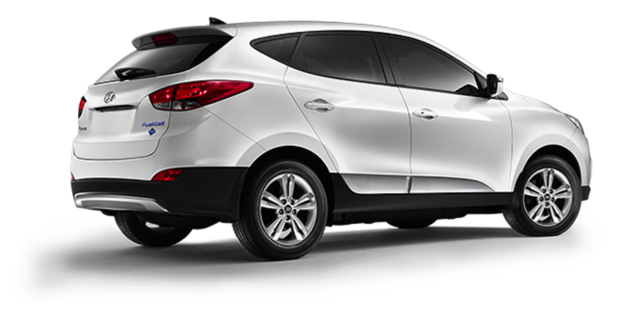 Hyundai, which began leasing its Tucson Fuel Cell in June, pledged to produce 1,000 units this year. Hydrogen fuel cell cars have remarkable advantages over all-electric vehicles, such as the Tesla Model S, in that they can travel 300 miles on a tank of fuel and can refuel in just five minutes. By comparison, a Tesla using the company's so-called "Superchargers" requires at least 20 minutes to achieve a half-charged battery. A full charge will provide a range of up to 265 miles. Toyota's RAV4 electric vehicle can go a maximum of 125 miles on one charge. Key to hydrogen fuel cell-vehicle adoption will be availability of refueling stations and the cost of the fuel. Tesla's 94 Supercharging stations now cover most of the metropolitan areas in the U.S., the company said. In a year, Tesla Motors CEO Elon Musk expects Supercharging stations to be within reach of 98% of the U.S. and Canadian population. The cost of the charging stations is built into the price of a Tesla car, so recharging is done for free. If mass-produced and widely distributed like gasoline, the cost of hydrogen fuel would be equivalent to about $1 per gallon or less, according to U.S. government and industry sources. Honda's FCX Clarity Fuel Cell Electric Vehicle is due in 2016. Toyota said it is providing three years' worth of free hydrogen for the initial buyers of the Mirai. The hydrogen fueling infrastructure is in its infancy. Refueling stations are few and far between. California is expected to build 28 stations by the end of 2016, bringing the state's total to 48 stations, according to Toyota spokeswoman Jana Hartline. Toyota has partnered with FirstElement Fuel to build refueling stations in California. Toyota has also partnered with hydrogen fuel provider Air Liquide to build a network of 12 stations throughout Connecticut, Massachusetts, New Jersey, New York and Rhode Island next year. "So we're working on both coasts to ensure infrastructure is available," Hartline said. The Toyota Mirai has two high-pressure fuel tanks that are 62.4 liters and 60 liters, respectively, in size. Each tank can hold up to 87.5 megapascals (MPa) of fuel. A megapascal is a metric unit of measurement that's roughly equivalent to 145 pounds per square inch (psi) of pressure. For example, 70 MPa would be equal to about 10,000 psi. The Mirai's fuel tanks are wrapped in carbon fiber-wrapped resin that meet international standards for compressed hydrogen storage containers for vehicle fuel systems, Toyota said. 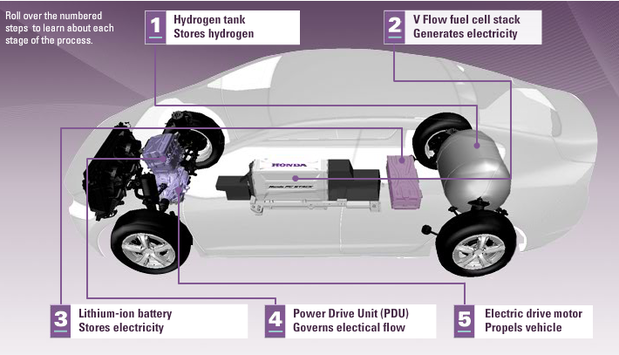 The fuel cell tanks drive a generator, which charges a lithium-ion battery. It is the battery that ultimately powers an electric motor that propels a vehicle. A depiction of the Honda FCX Clarity Fuel Cell Electric Vehicle's drive train. There are several methods for creating hydrogen fuel, but the most common today is called steam-methane reformation, a process by which high-temperature steam (1,000 degrees Celsius) creates a reaction with methane gas in the presence of a catalyst to produce hydrogen, carbon monoxide, and a relatively small amount of carbon dioxide. The carbon dioxide and other impurities are then removed through a process called "pressure-swing adsorption," leaving essentially pure hydrogen. Steam reformation can also be used with ethanol, propane, or even gasoline to produce hydrogen. Steam-methane reformation is most commonly used by oil refineries, which then use the remaining hydrogen to remove impurities, such as sulfur, from petroleum and diesel fuels. Hydrogen has also been produced using photovoltaics, or solar power, which converts the sun’s energy into hydrogen fuel and stores it to use after the sun goes down or the wind stops blowing. The hydrogen acts as a buffer to produce electricity during those times. In that process, a photoelectrosynthesis cell generates hydrogen fuel by using solar power (electricity) to split hydrogen molecules from water (H2O). In that process, the hydrogen is stored, while the byproduct, oxygen, is released. In Connecticut, for example, SunHydro is using photovoltaic (PV) panels in a chain of privately funded solar-powered hydrogen fueling stations. Currently, SunHydro has one station in Wallingford, Conn., but plans to soon open a second station in Braintree, Mass. Hydrogen fuel cell vehicles also scale well and are already being used in trucks and buses. That's an advantage for hydrogen vehicles since all-electric engines don't perform as well in larger vehicles, which require bigger batteries that need more charging, according to Devin Lindsay, IHS Automotive's senior analyst. While Lindsay said hydrogen fuel cell vehicles will sell alongside all-electric and hybrids for the foreseeable future, he noted that Toyota has scaled back its efforts in all-electric vehicles. 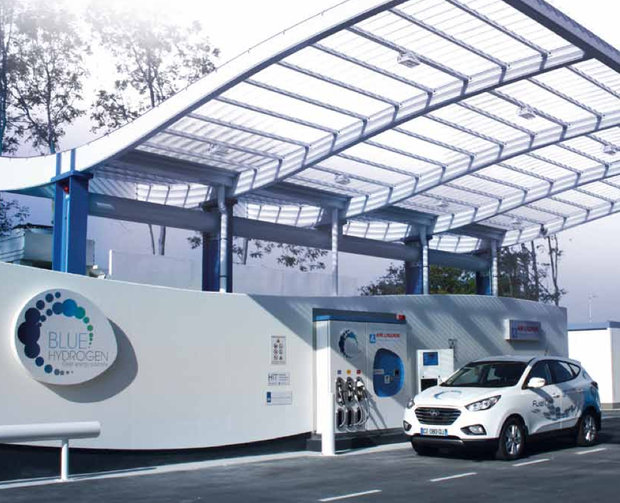 A Hyundai Fuel Cell Vehicle at an Air Liquide refueling station. "It boils down to giving consumers the vehicle they need to fit their lifestyle. Battery electric vehicles have a place for shorter range driving and urban areas," Lindsay said. "I think all of the manufacturers view battery electric as kind of a stepping stone to get us to fuel cells. So right now I think it's less about one taking away from another, and more about one complementing another." While Toyota's zero emission Mirai vehicle may sound expensive, consider that an all-electric Tesla S sports sedan has a base price of $50,000. According to auto news site Edmunds.com, depending on where you live, state and federal clean vehicle rebate incentives are likely to reach $13,000 "to reduce the sticker shock to a more manageable $44,500." The Mirai can also be leased for $499 per month over 36 months (with a $3,649 down payment), which Edmunds said will be a "vastly" more popular option than purchasing a vehicle outright. During a media event at the L.A. Auto Show, Satoshi Ogiso, managing officer for Toyota, said a Mirai hydrogen fueled electric battery "is capable of supplying enough energy to power home essentials in an average house for up to a week in an emergency." The car can refuel in three to five minutes, according to Toyota. The Mirai has a maximum output of 152 horsepower and 247 pound-feet of torque. The fuel cell car is based on the Prius V chassis and suspension. Additionally, many current-generation Prius hybrid components were used extensively in the fuel cell powertrain, including the electric motor, power control and main battery, according to Ogiso. Fuel cell cars are not new and most major car makers have tested various models over the past decade or more. For example, over the past 14 years, Toyota has been developing and testing more than 100 prototypes -- including Prius and Highlander models -- of fuel cell vehicles. In putting more than 1 million miles on those prototypes, the company claims to have found new ways to "dramatically reduce the cost of building a fuel cell powertrain." "In fact, we estimate a 95% cost reduction in the powertrain and fuel tanks in the Mirai compared to what it cost to build the Highlander fuel cell back in 2008," Ogiso said. 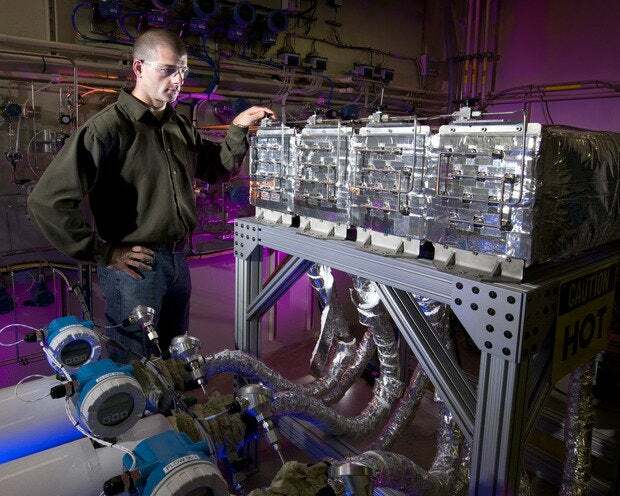 A hydrogen fuel cell storage system at the Sandia National Laboratory.